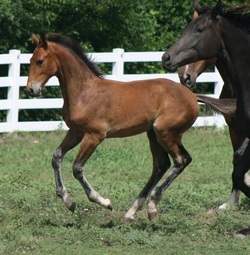 We are a small, family run warmblood breeding farm in Coupland, Texas. We focus on breeding two to three high quality foals each year. Our main focus is breeding rideable horse with fantastic gaits that will be successful in the show ring. Every match is chosen with care to combine the best bloodlines, performance records and progeny results. We also have a training program running out of SMF, Concordia Dressage, run by Jenna Stern & Martin Arnold. They offer riding lessons, full and partial training options and clinics. NEWS: Our only foal for 2014 has arrived! Gran Tango was born April 2. He is a beautiful bay colt by Gran Casso and out of Zarina by Contango. He is our first colt by Gran Casso! He will be registered with the OLD NA.